I was intending this game as a quick diversion to be followed by an end of year game but it looks like this is it so I'll postpone any chat about rules etc, wrap this post and call it a year. 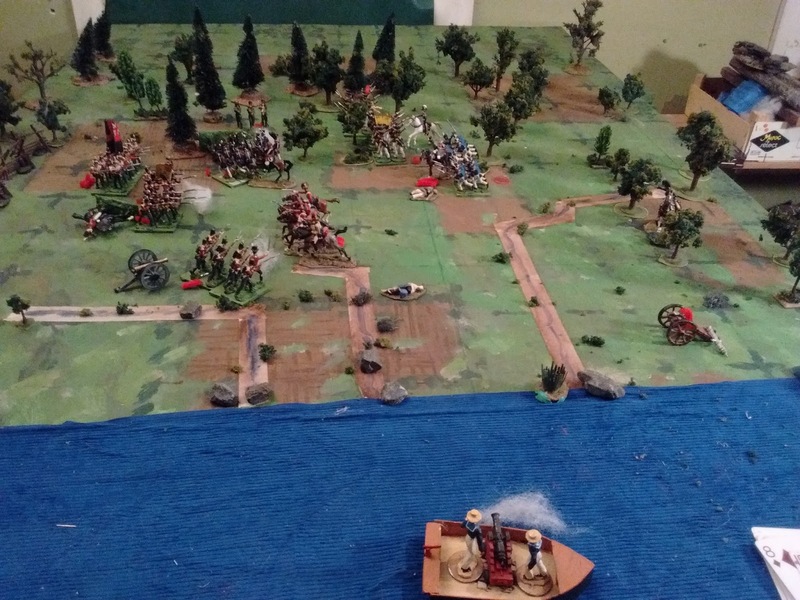 This Grant scenario was chosen because it felt vaguely more appropriate to the period than some others but I'm a bit embarrassed to admit that I didn't recognize the vague similarity to the "battle" of Fish Creek until after the game had started. Good choice by instinct! Deadground: Game 2, using the Square Brigadier. 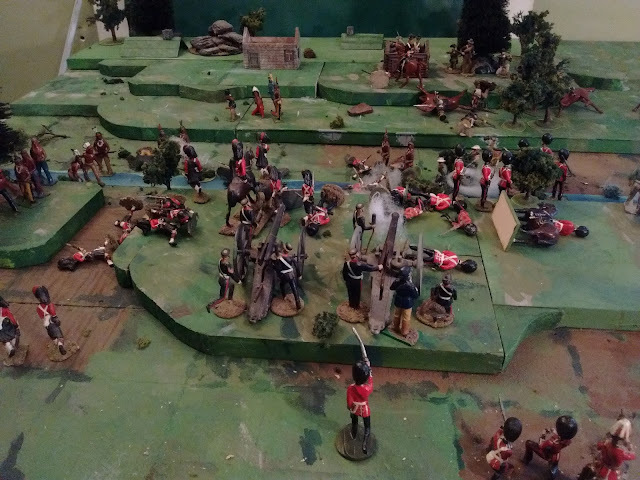 The Canadians advance, 5th Royal Highlanders to the left, Hochelaga Fusiliers to the right, guns in the center and mounted troops flanking on the right. Their objective is to take the farms visible on the ridge in the distance by the end of turn 15. As the troops reach the row of squares at the far edge of the first hill they discover the hidden stream and the enemy hiding in ambush. Troops in the gully may only shoot or be shot at troops on the edge. The artillery for example can only see the far ridge. The lead companies of the Fusiliers are hit hard and have to pull back to rally covered by the reserve companies. 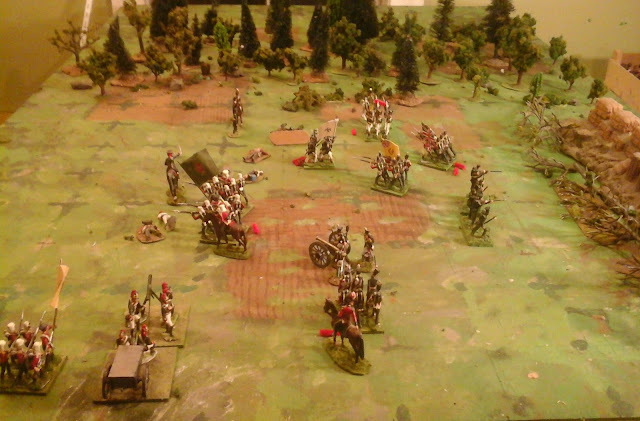 The Highlanders push forward but are caught in a heavy crossfire of 5's and 6's and are also thrown back. 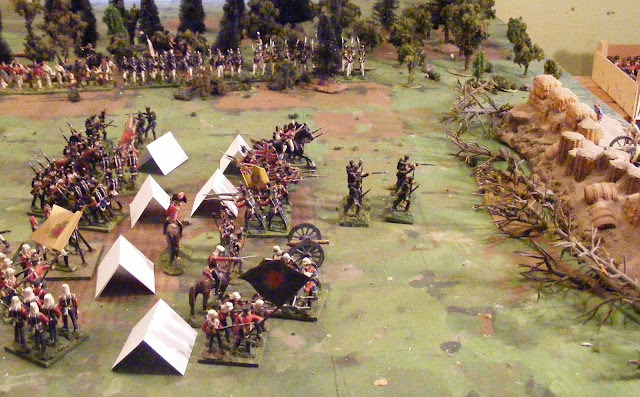 The mounted contingent however finds an opening on the right and the cavalry push forward covered by fire from dismounted Scouts. Turn 15. 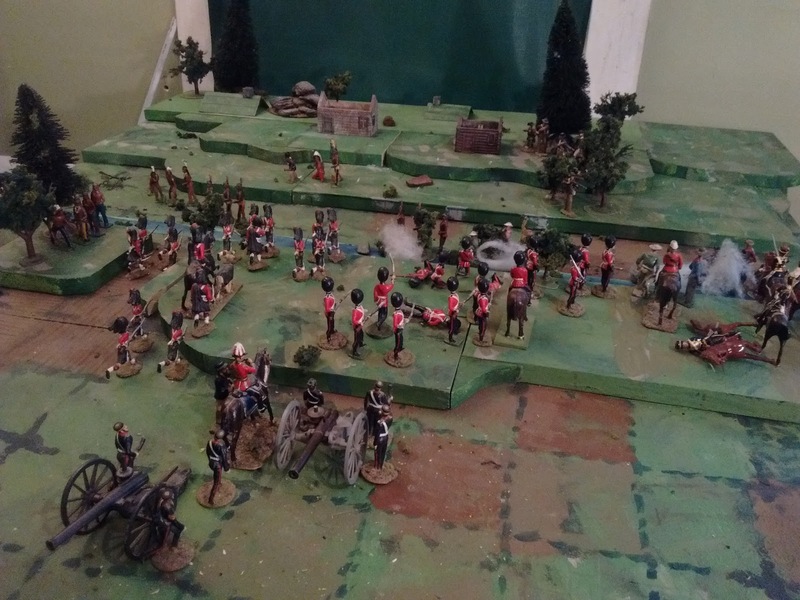 The line has stabilised and the Fusiliers have pushed forward under General Centerton's command and have taken one of the farms but losses have been heavy, the fight is far from over and the sun is sinking low. 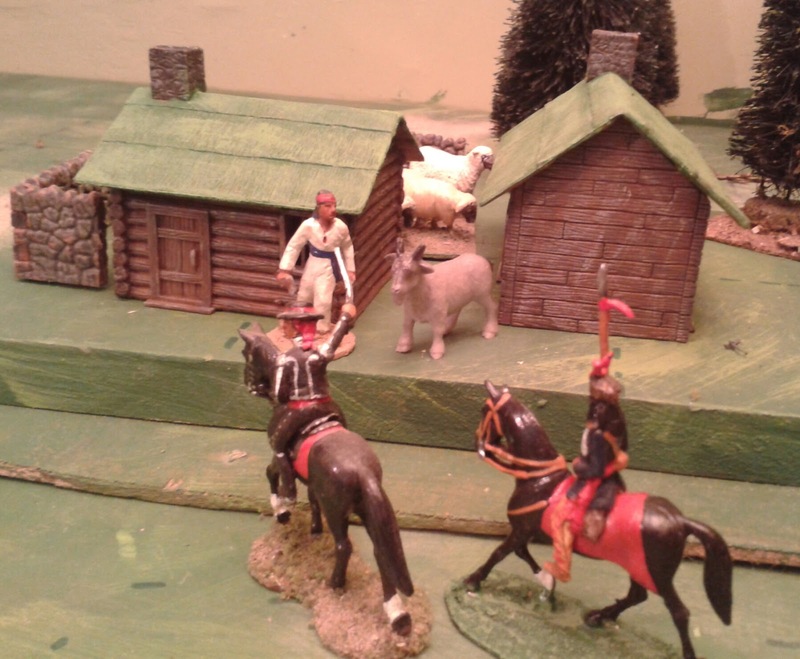 The General must get his men and especially his wounded back to the laager and safety before night falls. Reluctantly he orders a retreat but the war is NOT over. They will be back! Wishing a happy 2016 to you all! Here is the end of the first game using Battlecry to start and The Tin Army to finish. A satisfying conclusion to an OK game as the Canadians seize the Rebel leader and the objective, breaking the Rebel force. So much for outcomes, I decided that gamewise, I could do better. I broke out an old version of the Square Brigadier, added a twist then reset the table. Gallant charge of the Hochelaga Fusiliers. But I'm getting ahead of myself. The scenario is #8 Deadgound from Scenarios for Wargames. Ideally the attacking player should be shown a table with a hill that slopes up to the farms without interruptions. I've only rarely managed to pull that off but in one memorable F&F ACW game Ron used his geohex to spring it on Doug who unwittingly managed to unlimber several batteries on the very edge of the unseen ravine. 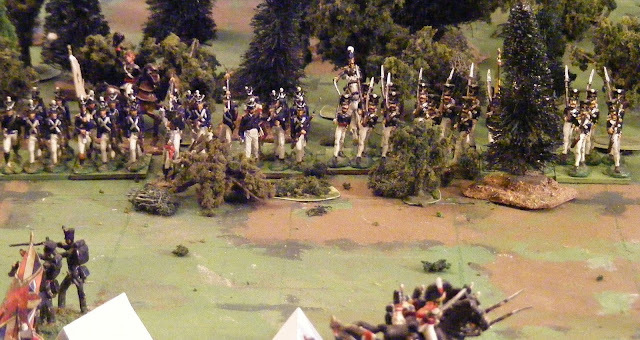 When the real terrain was revealed, so was my hidden unit of Louisiana Tigers, across the stream, just out of rifle range of several Yankee batteries. Tables turned! The ambush didn't go well for the Tigers. But now I digress. Unfortunately, time is up so this will continue tomorrow. The Rebel Alliance is in Sight, Sir. At last, outside the snow is gently falling and inside its the day after the day after. What the Canadians can see. Metis and Cree. Well, what rebels did you think I meant? Having made the decision to resurrect my 54mm Britain's I need to decide some little details like rules and organization. There is little point in doing a taller version of an Atlantica game but neither I nor my smaller table are really up for full 54mm MacDuff or TS&TF games. While not thinking about it today, I suddenly remembered my "Battle Cree" post from 2012. Perfect! So, squares rather than hexes, cards & dice from the BattleCry game and Colonial variant rules that Ron and I use, with Metis & Cree troop type added. or maybe an older version of the Square Brigadier... Ah yes. The early 20thC was a time of excited invention and a push to make use of new technologies and to make money. One hotbed of invention and experiment was the continuous or caterpiller track tractor. Companies like Hornsby in the UK and Holt in the USA were demonstrating effect models by 1905. Hornsby even proposed mounting a gun on one but did not pursue the project. In WWI such caterpiller tractors were widely used by the Allies for hauling artillery and other heavy loads and eventually provided the basis for the design of the Tank. I am sure it will be no surprise to readers that Atlantica was way ahead of the curve. In late 1905 the Dinkie Arms Company produced a lightly armoured, tracked, combat tractor nicknamed the Armadillo. It was very small with a crew of 2 men, a driver and a commander/machine gunner, but it was a promising entry into the market and its excellent cross country ability was of especial interest for those areas where lack of good roads and train tracks limited the possibilities of support by armoured cars and armoured trains. 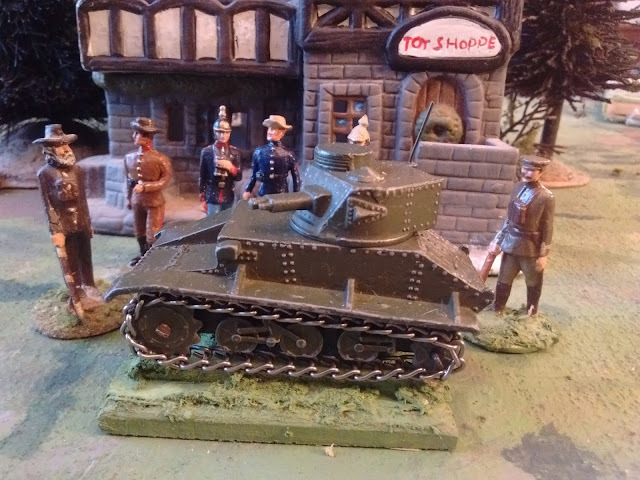 The design of this early vehicle was so successful that 30 years later it was scaled up and turned into a light tank. Bidding by competing interests was fierce. Merry Christmas and Tanks to all! My best wishes for a Merry Yule to all those who take time to read my tablet pokings. May your days grow longer and brighter through the winter ahead. And an especial thanks to those who have dropped a comment now and then and reassured me that it's not just me and the bots out here. It's that time of year, Ol' Man Winter is dragging his heels so there's time yet for some of the winterizing bits that I thought I wasn't going to get done, Kathy's busy downstairs grooming overtime getting people's pooches primped for Christmas and so needing a steady supply of tea and fresh baked stuff to keep her strength up and so on. Still I have found a minute here and there. Another day, another stockade to be stormed. Would be nice to have a hole to go through. And a gunner's eye view. I confess, it does feel good to be getting the early Atlantica stuff back on track again. 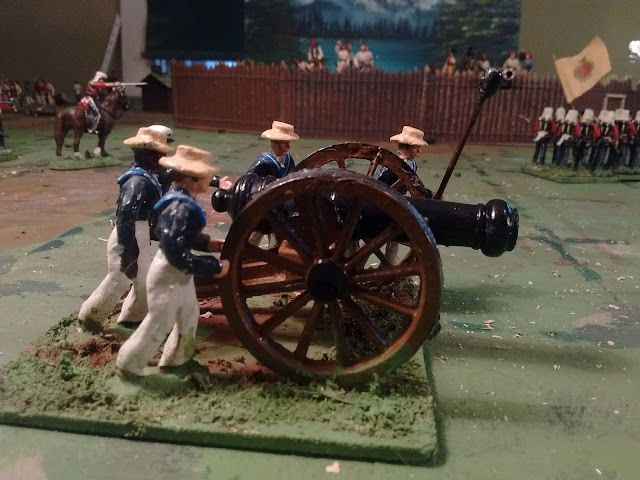 Now that I'm finally moving on the (several years old) plan to consolidate my 40mm Atlantican (and historical 19/20th Century) armies into just two collections, I decided it was time to make my 1857 Naval Brigade pass their 2nd Boer War 4.7" gun to the army and give them the 24 pdr Lucknow gun they were originally meant to have. The raw material, yet another Hong Kong Marx copy, a set of wagon wheels and a souvenir shop naval gun. A few days ago I decided I had time for a quick game. Flipping open OHW, I found myself looking at Scenario 22: Ambush. Six Red units poised to attack 1 Blue unit in a town. Except Red isn't allowed to attack the town. Blue has 3 more units in the woods ready to attack. For 3 turns no Red unit may move or shoot and after that they are allowed to shoot at the town but can't assault it. OK, why not? I suspect one isn't supposed to ask why not but I hate games that don't look "right" so I postulated that perhaps the town was protected by a high wall and a wet ditch, not very War of 1812 ish. Perhaps Fort MacDuff? 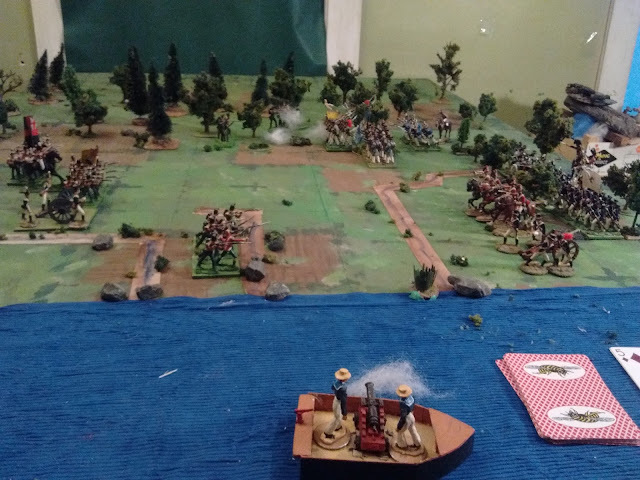 Sounded like work, then my eye fell on my New Orleans redoubt from Barzso and suddenly I "HAD" to haul out the pirates which in turn meant leaving the War of 1812 for Atlantica. By the time I was set up my hour was long gone so I took a picture and left it. Over night I started wondering why Red couldn't react for three turns, not even in self defence. The only thing I could think of was a dawn assault on a sleeping camp. When I scraped up an hour it took five minutes to fold some paper tents and I was ready to go. Some chance of waking and reacting seemed reasonable but I decided to play it straight up except with my rules. 15 minutes later Red was routed and the game was over. Not terribly satisfying but a large part of that was with the rules. It had been bothering me that despite some period rules, formed 1812 or 1830's line battalions seem to be either as flexible as skirmishing 1900 infantry deployed in companies or as very brittle. I experimented with various things and managed to stretch the game to 5 turns but in the end, the only thing that seems to work right is to just make them stronger so that they can ignore occasional hits when they are fresh. I'll test that this weekend but I'm also going to allow Red to attempt to wake guys up once the shooting starts. The Blue Menace! Oberhilse troops over the mountains! I unexpectedly found an hour this evening to play. The increase in number of hits made all the difference. All I ended up doing for reaction was to allow units that were fired on or meleed to shoot before the 4th turn. It looked pretty close at times but Blue had some terrible dice and Red pulled 3 chance cards in their favour including a rally. At the end, Red had 4 units only 1 or 2 hits from breaking and had lost 3 Commanders but they had only lost 2 units out of 10 on Turn Nine when Blue broke after losing 4 units. Blue's biggest error was probably committing the Brethren light infantry to close combat with massed battalions of regulars. I should also note that some of the combats got a bit confusing and I trotted out some extra rules for things like multi unit column assaults etc which aren't in the quick summary. 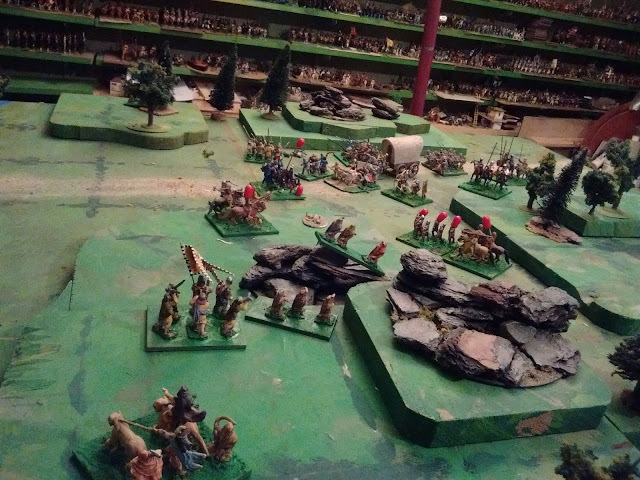 As for the scenario, although there were some tense moments during the combats, there was so little room to manouver and too few options to make it a really interesting game. For a dimilar situation I'd go back to the Grant Attack on a Camp scenario, always an engaging game if slightly longer and more complex. 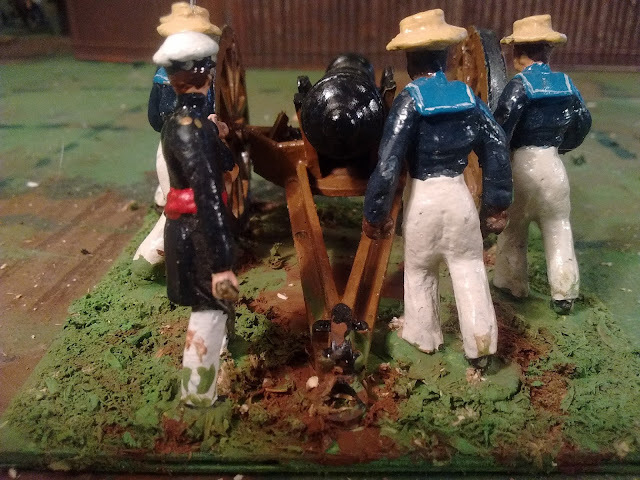 For those who have an interest in vintage/antique toy soldiers and "pre- wargaming hobby" wargames but don't follow the Steam, Steel and Torpedoes blog, check this post on a how-to Wargame article from 1900. (or Clicky as some might say). Meanwhile, progress is rapid on the reorganization of the early Atlantica armies and, rolling back the clock to c1830, an amphibious expedition is underway against a Brethren of the Coast refuge on the coast of what will become known as the Kapelle Territory, right next door to the Oberhilse trading zone which will become Oerberg. On Saturday I managed to squeeze a quick run through of Crysler's Farm using the apparently not yet written War of 1812 module of The Tin Army. Luckily it was just me since it was a bit of a shambles. 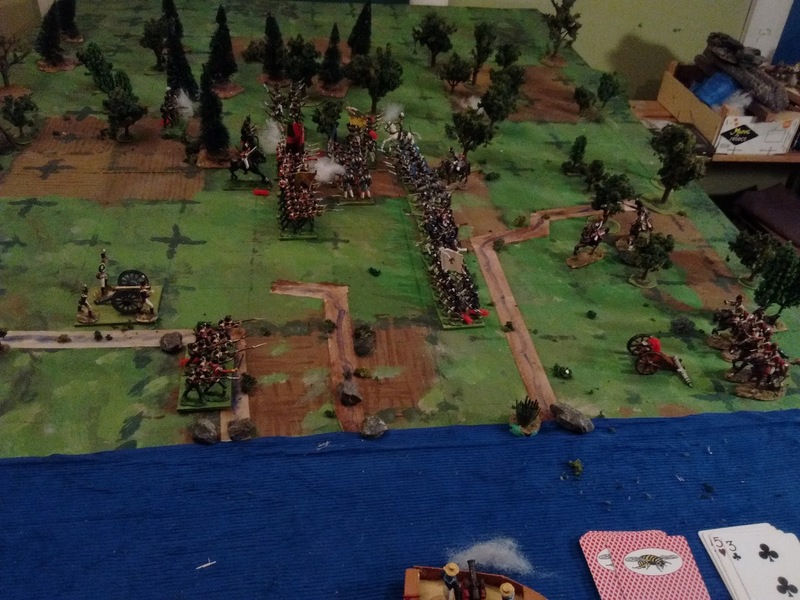 I had rather overdone the scenario specific troop and commander penalties and bonuses and forgot to reduce the firepower of the smoothbore muskets and 6pdr batteries so essentially the troops were treated as having rifled muskets and 12pdr guns. I was also quickly confused by the recent change in how I handled casualty reduction for cover etc. and discovered a few more errors and ommissions in the summary. Didn't quit though, or change rules 1/2 way, just dropped the special scenario rules and pushed on. The resulting game was quick, bloody and a bit exciting in a nerve wracking way but the Yanks liked it well enough, especially as only 2 chance cards popped up out of 15, both in their favour and both right near the end when they were most useful. Their first win at Crysler's Farm, ever (well on my table anyway). Yesterday I reset and played it again. There are still some niggling rules issues and the pictures are particularly fuzzy again all but overall the game was an enjoyable nail biter/roller coaster down to the last card but with a slightly more appropriate feel for the period. Game 2, end of Turn 2. 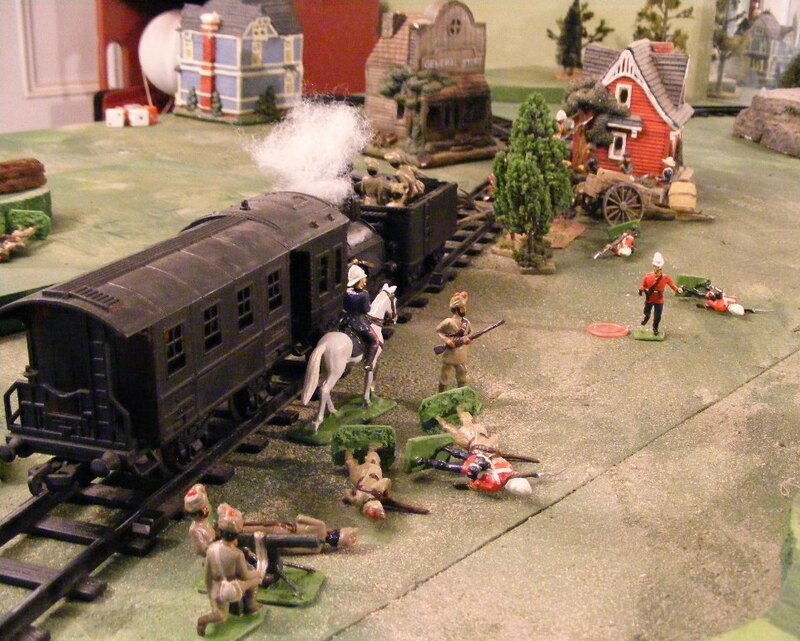 The Yankees are slowly clearing the wood and are bringing artillery up to support the attack in the middle. Game 2, Turn 5. The Gun boat has wrecked the American battery with 4 turns of fire while the battery only managed to drive the British back from the first gully to the second. The main battlelines are engaged and I was thinking the game only had 1 or 2 more turns to play. Game 2, c Turn 10 or 11. 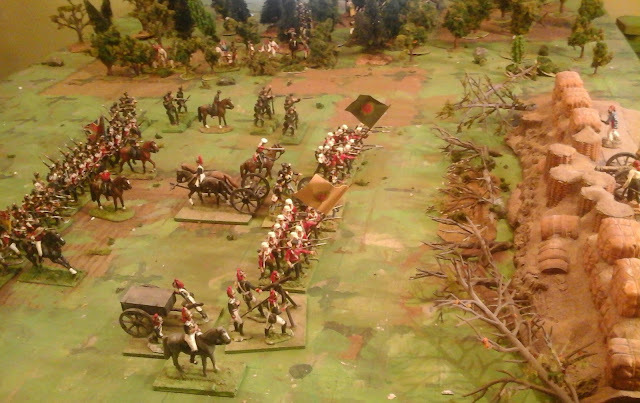 The Dragoons have risked all and over run the isolated British battery. Meanwhile the British regulars have been hit hard and driven back. Col. Morrison is down and only their Elite status is holding the regulars on the field. The US have also lost heavily and since the next effective hit on any 1 of 3 units on each side would break the morale of that army I figured the game had one maybe two turns left. Game 2, end of Turn 15. The only chance card of the game reduced game length by 1 turn and a series of low command roles (with a -1 penalty for the loss of their commander the Brits rolled three 1's in a row!) was matched by ineffective but dangerous shooting by both sides, forcing units back but not destroying them, the last phase had the feeling of two exhausted armies standing off. 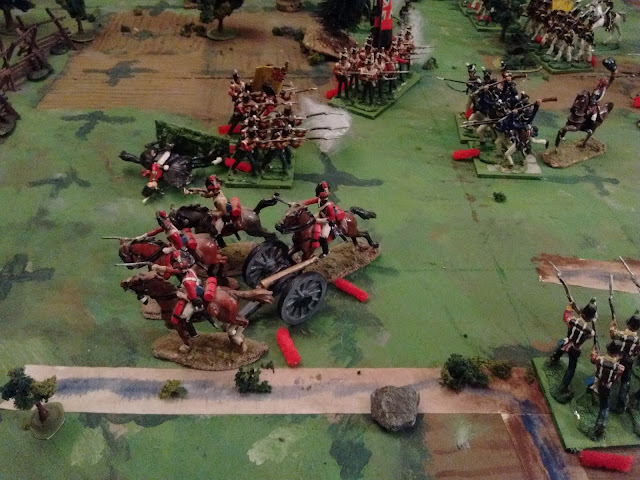 When the last turn was played, despite the forward position of the American line, it was the closest I have yet come to an historical result, both armies bloodied but still on the field. The Americans have failed to disperse or destroy the smaller British force nipping on their heels on the way to Montreal. In the end there are 3 things with the rules that I need to attend to. The first was a simple transcription error when I made the quick summary. Infantry that moves 1 and fires is supposed to roll 1 die instead of the 2 rolled by stationary units. That was pure typing error not decision. I played it as written in the summary but like it better the way it is in the main rules which is how I usually play it. The second was the last minute reintroduction of the 1/2 caualties for cover rounded up or down depending on the cover. This works well enough for units that roll more dice and can take more hits but I already rejected the method for this game last year and went with the cancel 1 hit for cover method. Thats what I used in tbe last game and I have no idea why I switched when typing the summary but that will be put right. The third item has to do with the recent (in terms of games played) removal of a win/lose/tie melee resolution rule. I can't remember exactly why I decided to drop it but I miss it and am inclined to restore it as taking the decision to stand in a losing melee out of the General's (ie player's) hands. Lastly, the sharp eyed, nothing better to do sorts, might notice that the recent clarification in my mind about where this is all headed, has finally pushed me to carry out a long contemplated touch up the facings and trim on my "started as Cristinos, became Mexicans and then the San Carlos Grenadiers" unit so that they match the 1820's US style of the Lafeyette County Volunteer Rifles and those old, not quite accurate Victorian era prints of the War of 1812. That clatification of plans will be covered ere long in a more comprehensive look at the year ahead. Strike While the Tin is Hot. Here we go again. Brits to the left, Yankees to the right. The obvious squares are actually blocks of 4 grid squares. The table is laid out at 1 grid square (9cm) to roughly 150 paces. Line infantry average about 350 - 400 strong. The game will last 15 turns or 3-4 hours historical time. All infantry is musket armed. The British force of 3 line, 2 light infantry, a gun plus a gunboat which can't move, has only 1 commander but he has +1 to his Orders roll. The Americans with 6 infantry, a gun and a cavalry unit have 3 Brigadiers as well as a General but to reflect difficulties with coordination on the day have 2 penalties. The General must subtract 1 from each order die while the Brigadiers may only command their own infantry units. I'm all set up but have errands to run so the game is delayed to this evening or tomorrow. I've not had quite as much hobby time as I hoped this week and there have been too many things needing doing. Work on repainting the grid is about 1/2 done (the delay being a mix of wrapping and trying to decide how best to represent the terrain in Oberhilse and the Cyprus Hills) but I haven't started on the hills yet. The early 20th C Colonial rules module of The Tin Army is well started but mostly as notes. After a year of dithering over period, side and uniform, the Scruby Reb Infantry are finally painted but the first unit of cavalry is still being assembled. Oom Bob addresses The Clerk's Battalion, a volunteer unit of infantry , before they entrain and move to the Front. I also got some more of the back story done. There are three main classes in Oerberg. The Holders (short for Stakeholders) are the landowners. Only the Holders may own property, vote or sit in council. Any purchase of land must be approved by council. All holders are subject to military duty and when called must report with rifle, horse and two weeks rations. It is customary for the richer Holders to bring their own "volunteer" company of mounted rifles raised from their stockmen and farmhands. The Natives are the original inhabitants and those who have intermarried with them. Each tribe has a treaty with the State, runs its own affairs, and owns its own land. They are technically allies rather than subjects of Oerberg. Everyone else is a Renter. They may not vote or own property although they may operate businesses and indeed they run almost all businesses, stores, banks, government offices and small farms (leased) and may not bear arms unless a member of an authorized Volunteer Corps. Being a volunteer is not only essential if hoping to become a Holder but also earns a break on taxes. Unfortunately, neither troops nor terrain are ready but I am itching for a game. A short non-gridded game of something or other is called for I think then back to work on Oerberg. Its the little things quite often. A few days ago I decided to play Santa and buy myself a Rolls Royce for Christmas, a Matchbox 1/43 Armoured Car to be more precise. As I searched ebay looking forlornly at the silly prices and the bright yellow desert paint job and wondering if I could get away with an out of period but pleasingly primitive looking and much cheaper Solido Renault R35 as a sort of Toy Soldier Stand In, I suddenly browsed too far. I had stumbled on the even more expensive 1/43 "toy soldier" Colonial tank of my dreams which I hadn't known existed. It is also slightly out of period like the R35 but even clunkier and less modern looking. I hesitated, I noted it, I enquired about dimensions, I went away and I pondered. 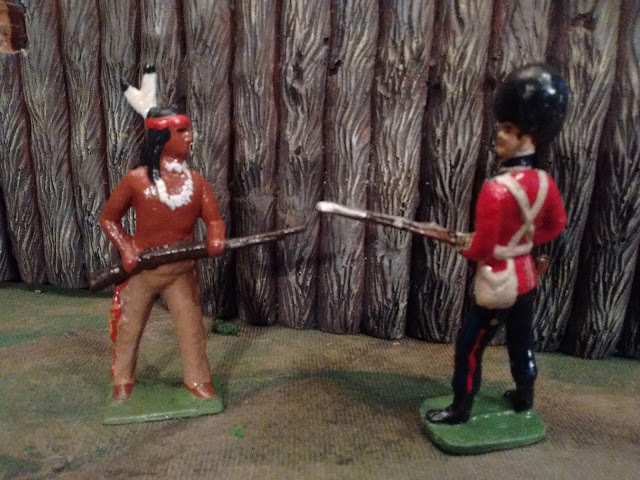 Where exactly did I want to go with this Colonial game, what is the historical/fictional background, what "look" do I want for troops and terrain and what do I have that I want to include? I also wondered why I've really made so little progress in the 15 months since I decided that I wanted to do this. The short answer is that when I decided to finally "do" WWI I opened the door to a huge number of suppressed urges by painting my sepoys in the khaki worn on various Colonial campaigns rather than the drab service dress issued shortly after arriving in France. Having opened it, I then rushed through and have been so boondoggled by the options, the hard to reconcile temperate and tropical uniforms and the work involved on casting a whole horde on new figures, that I've been stymied. So, I reviewed what I've done so far and decided that based on what we seen so far, Oerburg is a suitable setting for the darker drab uniforms that most of my existing figures wear. This will allow me to use existing moulds to cast and convert many of the remaining units rather than having to make multiple new masters and moulds. It also means we already know what the terrain, architecture and native enemies look like so no deserts, palmtrees, adobe villages or turbans, at least, not yet. A typical Kapelle native hamlet composed of small wooden cabins with sod roofs. There are mountains on the map though, and wide open spaces and the drab colour scheme will fit my, new to me, ...well I'll show you when it gets here. After last month's Martian victory in Dartmouth, Nova Scotia was rocked by a completely unrelated invasion across the harbour in Halifax. 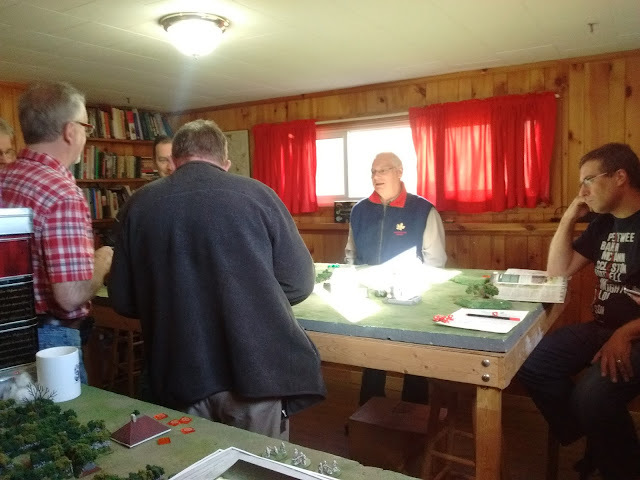 Today a group of Veteran wargamers renewed a 35 year old alliance to stop their advance. The Martian goal was to penetrate our defences within 6 turns. Our goal was to stop them or die trying. I commanded a thin front line of 2 infantry and 1 MG units, Paul commanded 2 tank units supporting the center and right. 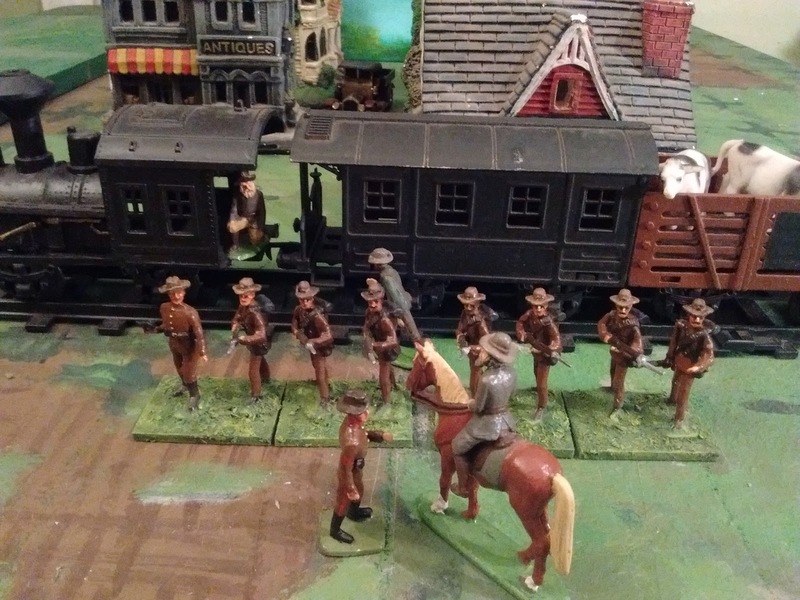 Bob had overall command and a reserve of tanks on the left and Rough Riders in the center. Ron commanded a scout tripod and a standard one, host Martin another tripod and Ian, the Martian commander, also controlled another tripod. While Ron probed the center the rest advanced upon our left. After some fierce fighting my infantry, backed by tanks had damaged 2 tripods but had lost 2 units. Paul commited the right wing tanks and took out the scout. Two turns left, human spirits rose. 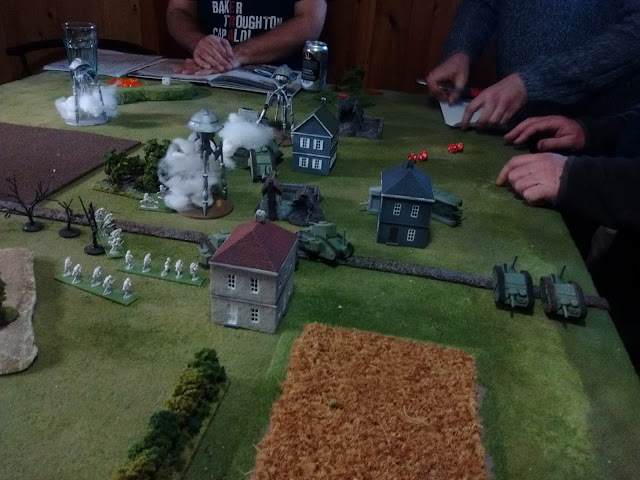 The Martians responded by swiftly reversing direction striding right over our lines and Martin wiped out Paul's tank unit with a single (lucky) sweep. We scrambled to catch up but Martin followed this up on the last turn by routing Paul's last unit. He was about to follow up and disperse them but we talked him out of it, in good faith. All he had to do was survive our turn to win the game, umn unless we blew up one of the other tripods. As it happens, Ron had been ordered up with a damaged tripod against his best judgement. He lost control and ended up in assault range of the rough riders, facing away. To add injury to insult, the last damaged tripod tried to fire but a malfunction resulted in it blasting Ron instead. My colleagues allowed my infantry to fire the coup de grace. Good to get together with several old friends and some new ones. Hopefully something that will happen more often this year. It was only after the game that we discovered that Martin's move to disperse the routed tanks would have broken our army morale and ended the game before our last turn. To be fair we also learned that Bob could have used command tokens to replace 2 of our destroyed units in which case we wouldn't have broken. Not that it mattters. A good time was had by all, 4 new players introduced to the game and Jason got to field a small part of his All Quiet hordes. Structurally the new table is ready. The rear has legs on sliders while the front rests on sliders on the top of the book case. This will allow me to slide it forward to access the window, something that has been a concern to me. Tomorrow I will lay down the grid then touch up the paint. For non-gridded games I will probably go back to throwing a cloth over the wooden hills. Moving the bookshelf, along with recent figure sales has given me room to add more wall shelves for troops and equipment and to increase the space between shelves. 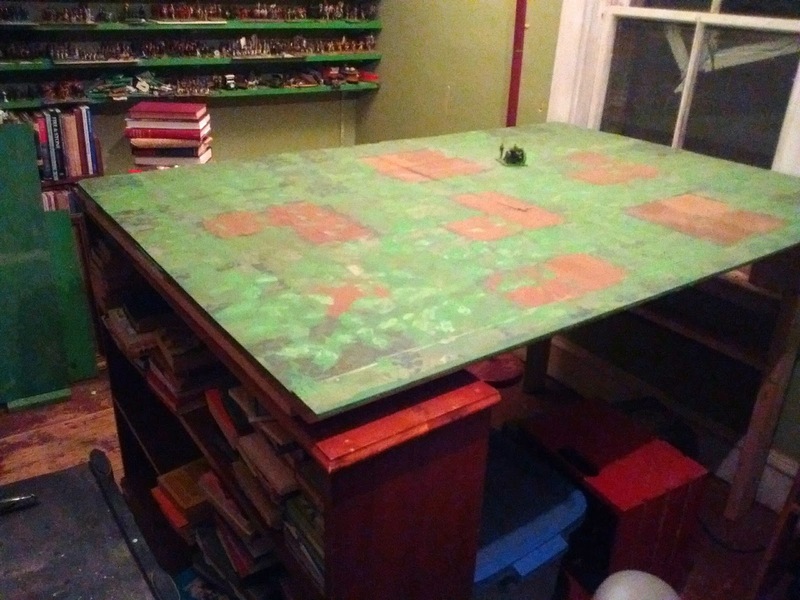 Enough about the table, what's coming up for games and painting this winter? All of my chosen major collections have been out this year but all in all its been too choppy and concerned with choosing a path to really get into any of them. This winter I want to focus a little more and concentrate on 3 with occasional short breaks to work on other figures as the urge hits. The secondary focus will be on the OSW medieval fantasy, refurbishing old figures and painting new ones including more fantasy elements as well as more testing of rules. This is one of a handful of plans where I have a "finished" target in mind. Lastly, after years of dithering and delay I want to get on with refurbishing the old 54's for the proposed Cyprus Hills campaign. The main issue is that I foolishly allowed myself to start in on the same era in 40mm figuring I would just move the 54's on. Turns out they're pretty sticky on the Seniority issue and are here for the long haul. Since I want to avoid duplication it looks like the planned 40mm equivalents that have been on hold in the queue for 2 years now as well as the painted ones that fit that period are once again on notice. Unless this winter brings up a good reason to dispose of the 54's, any of the 1870's to 90's 40mm troops will have to be reassigned forward or backward in time. Which is where I was in 2008. Stubborn rather than smart then. That should allow me to make some progress on troops and terrain, get some mini-mini-campaigns going and still leave room for an occasional impulse game with other table ready troops. The rules are designed as a warGame and so rules may be used to play skirmishes and battles without adjustments. The main rules are being written for games set between roughly 1812 to 1912 with charts, unit types and special rules for various subperiods. This summary is for generic mid 19thC games. Definitions. All measurement by “area” (grid square). If not using grid 1 area = roughly a unit width. Formation is 2 or more units of same type + Commander. Units aligned, adjacent and facing same way ** in open terrain. A unit suffering 1/2 hits ignores fractions of a hit. Units. A unit is what fits in an area or is what is agreed upon. Units are treated as 1 stand. Line Infantry can take 6 4 hits, other units 3 hits. Increase by 1 if Elite, decrease by 1 if Poor. Sequence of play. . Draw a chance card, 1st player rolls for orders then moves and conducts skirmish and artillery fire. Both sides resolve attacks, 2nd Player rolls for orders then moves and conducts skirmish and artillery fire. Both sides resolve attacks. Chance Cards. Use ordinary deck inc Joker. One side is Black the other Red. Shuffle then make a deck with 1 card per maximum number of turns. Draw 1 each turn. Only Facecards, Aces and Jokers count others are “No Effect”.. Cards affect player based on colour. Chance card selection msy be changed by GM or by agreement. King: Move or Shoot with 1 Formation or Unit of either side. An attack is resolved immediately. Enemy formation may not be moved off table or make an illegal move. A unit which moves or shoots may not move or shoot again later. Queen. Move or Shoot with 1 Unit as above. A unit of unscheduled reinforcements arrives or remove 1d6 hits from units on table. Jack Select one unit of either side that may not move this turn and may not Give Ground. The unit may still shoot. Ace. A unit of unscheduled reinforcements arrives or remove 1d6 hits from units on table. Joker. Discard the next 1d6/2 cards from the deck shortening the game. Orders. 1d6 = Number of orders available. 1 order allows 1 unit or 1 formation to move. If formation is not with General’s LOS then 1d6=3+ or order is lost. Light troops may move without order on 4,5,6. Stacking. Units may pass through each other but there may never be more than 1 unit in an area at the end of movement. Commanders do not count as a unit for any purpose including stacking. Facing. A unit may move in any direction unless engaged or attacking and may end its turn facing any direction. A stand's arc of fire covers a 180 degree arc centered on the direction it is facing. Movement. Units may only move when ordered or as a combat result. Distances are maximums. Cavalry: If mounted move 3, if dismounted move 1. Infantry, Artillery may move 2. Attacks. Any move adjacent to enemy front, flank, rear. Must stop and resolve combat. May not attack an area that unit may not enter. A unit may not attack while Giving Ground or retreating from combat.Artillery and transport units may not attack a known enemy. Clear terrain. All units may move full. Woods. Light Infantry no effect. Others stop on entering each area. Arty wagons may not enter. Woods block line of sight and provide cover. Hills. Gentle hills have no effect on movement. Troops other than light infantry moving on a steep hill must stop when they enter a steep hill area. Only infantry may enter a rocky hill area. Rocky hills provide cover for infantry. Towns. Any troops may move through a town if following a road but only infantry may occupy a town. A town provides cover and may be fortified. Roads. A unit moving its entire move along a road increases its move by 1 but may not shoot or attack. While following the road a unit may ignore off road terrain other than steep hills. Linear Obstacles. Stop upon crossing if rated passable. 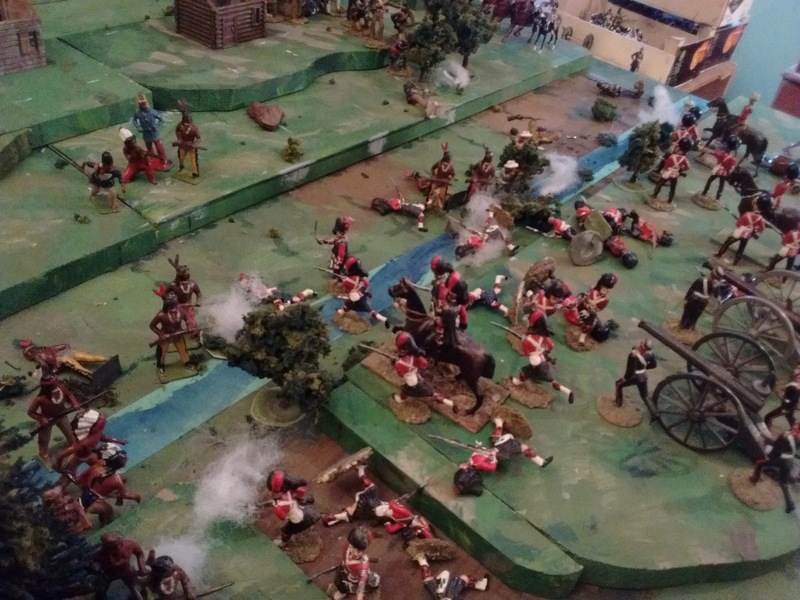 Artillery and Skirmisher fire. Infantry may move 1 and shoot. Cavalry may dismount and shoot. May not shoot and attack, may not shoot if adjacent to enemy, may not shoot at target adjacent to friend. All infantry and dismounted cavalry do skirmisher fire unless otherwise noted (eg native spears). Ranges: Rifles 3. Breechloaders are superior as are sharpshooter light infantry, Muskets are inferior, Carbines 2, Generic Artillery 8 but superior up to 4. 2 d6 per unit. @ 5,6 is a hit. -1 if rated inferior firepower. Dense Targets. If there is a 2nd target directly behind first and both are in the open then arty rerolls misses vs 2nd target. Indirect and Overhead Fire. 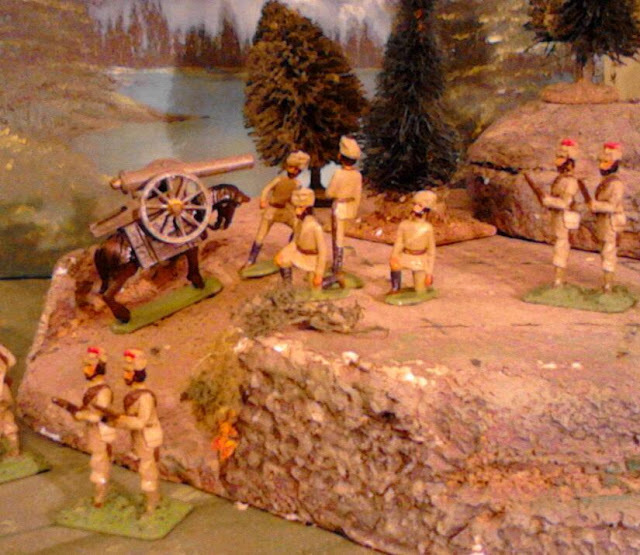 Guns may fire over intervening friendly troops on lower ground. Giving Ground. A unit may cancel 1/2 hits by immediately retreating a full move. It may not move adjacent to enemy while doing so or violate stacking. A unit that gives ground may not shoot or move on its next turn. Combat. (Attack Resolution) Combat is close range shooting + charges. Defensive Reaction. A unit which was attacked this turn may retreat a full move. It may not move or shoot on its next turn. Infantry, dismounted cavalry and artillery which were attacked this turn may roll their dice and apply results before the enemy rolls. The attacking unit may Give Ground as per shooting instead of fighting. If attacked by 2 enemies defensive fire against 1 only. Combat. Once defensive fire has been rolled, roll combat dice for all units which are adjacent to an enemy and did not roll for defensive fire this turn. Dice. Roll 4 dice for Line Infantry 3 for all others. +1 if Elite, -1 if Poor. Support. Add 1 die for each supporting adjacent unit which is not itself adjacent to enemy. Troops in fortifications suffer ½ casualties rounded down. Mutual Destruction. If both sides would be destroyed then they must both give ground. Defeat. A unit which received more hits than it inflicted is defeated and will immediately retreat a full move and may not shoot or move on its next turn. If neither side is destroyed or forced to retreat, mounted cavalry will immediately retreat and may not move or shoot on their next turn. Pursuit. A unit that attacked this turn may occupy the area vacated by the enemy if the enemy retreated before combat or was destroyed. Mounted Cavalry that pursue they may then advance an extra area and may resolve melee again with no defensive reaction by the enemy. Continuing melee. If opposing units remain adjacent and neither retreats during movement they will resolve combat again next turn with no defensive reaction and no shock bonus. Commanders in Combat. If a commander is with a unit which suffers hits from shooting or melee he may risk himself to inspire the men. On a score of 5 or 6 one hit is cancelled but a score of 1 indicates that he has been wounded or killed and must be removed. Subordinate commanders will not be replaced. If the General is lost his second in command will take over but all subsequent order dice will suffer a -1 penalty. If a General not stacked with a unit is adjacent to an enemy both sides roll a die. If gen is lower he is captured o/w he moves towards safety. Army Morale. Unless exempted by the scenario, a General who has lost over 1/2 of his units either destroyed, routed or forced to retreat off table, at the end of a player turn must concede the battle. May be modified by objectives held. If both sides reach this point in the same player turn then they both lose.